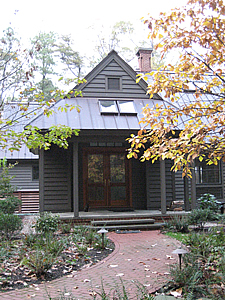 The Owners purchased a small point of land, deep in the woods. 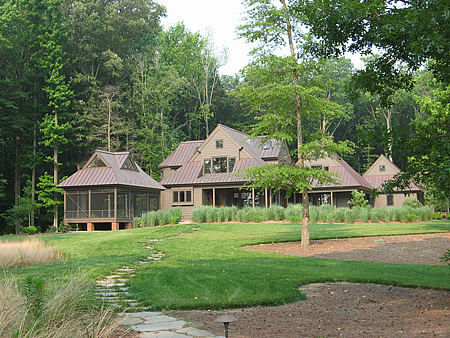 They told us they wanted a quiet house, where they could enjoy various views of the creek as it winds around their site. 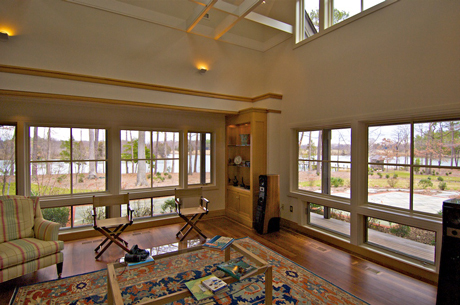 They asked that we equip the inside of their house like a boat, with functional, snug fitting cabinetry. Given the strength of the Owner's desires for views, we composed the house as a series of "pavilions" which step along a gentle ridge, parallel to the river. Together, these pavilions enjoy all of the Creek as it bends around them. We linked the pavilions by over-lapping their corners (as shown on the Design Strategypage) to create an interior of flowing spaces. We put the Living Room with its chimney at the center of all, and gathered the family spaces (the dining, kitchen, etc.) to the east for the morning light. There, in the southern light, a curved stair climbs past woodsy views to the master suite above and to the utilities below. In all, five pavilions are linked here in a graduated hierarchy from the Guest Wing to the Summerhouse (a free-standing screen porch). 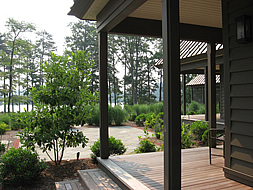 Each pavilion enjoys its own river views - its own landscape of privacy and peace. This house seeks an intimacy with the landscape, for the sake of the owners' everyday delight.